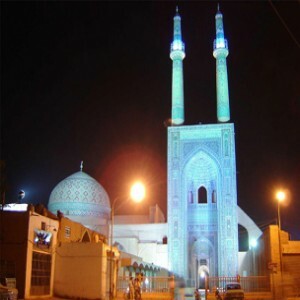 The J�?meh Mosque of Yazd is the grand , congregational mosque (J�?meh) of Yazd city , within the Yazd Province of Iran . The mosque is depicted on the obverse of the Iranian 200 rials banknote . The 12th-century mosque is still in use today . It was first built under Ala'oddoleh Garshasb of the Al-e Bouyeh dynasty . The mosque was largely rebuilt between 1324 and 1365 , and is one of the outstanding 14th century buildings of Iran . According to the historians , the mosque was constructed in the site of the Sassanid fire temple and Ala'oddoleh Garshasb commenced building the charming mosque . The previous mosque was constructed by order of Ala'oddoleh Kalanjar in 6th century A.H. , however the main construction of the present building was done by order of "Seyyed Rokn Al-din Mohammad QAZI" . Kharanaq is a village in Rabatat Rural District , Kharanaq District , Ardakan County , Yazd Province , Iran . At the 2006 census , its population was 433 , in 133 families . Chak Chak is a village in Rabatat Rural District , Kharanaq District , Ardakan County , Yazd Province , Iran . At the 2006 census , its existence was noted , but its population was not reported . 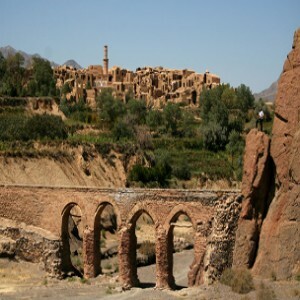 The village consists of a pir perched beneath a towering cliff face in the desert of central Iran . It is the most sacred of the mountain shrines of Zoroastrianism . Located near the city of Ardakan in Yazd Province , Chak Chak serves as a pilgrimage point for pious Zoroastrians . Each year from June 14-18 many thousands of Zoroastrians from Iran , India and other countries flock to the fire temple at Pir-e Sabz . Tradition has it that pilgrims are to stop the moment they see the sight of the temple and continue their journey on foot the rest of the way . In Zoroastrian belief , Chak Chak is where Nikbanou , second daughter of the last pre-Islamic Persian ruler , Yazdegerd III of the Sassanid Empire , was cornered by the invading Arab army in 640 CE . Fearing capture Nikbanou prayed to Ahura Mazda to protect her from her enemies . In response to Nikbanou's pleadings , the mountain miraculously opened up and sheltered her from the invaders . 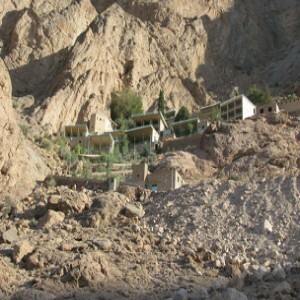 Notable features of Chak Chak include the ever-dripping spring located at the mountain . Legend has it that these drops are tears of grief that the mountain sheds in remembrance of Nikbanou . Growing beside the holy spring is an immense and ancient tree said to be Nikbanou's cane . Legend also has it that a petrified colorful cloth from Nikbanou was also visible in the rocks , although pilgrims have since removed it . The actual temple of Chak Chak is a man-made grotto sheltered by two large bronze doors . The shrine enclosure is floored with marble and its walls are darkened by fires kept eternally burning in the sanctuary . In the cliffs below the shrine are several roofed pavilions constructed to accommodate pilgrims . The Amir Chakhmaq Complex is a prominent structure in Yazd , Iran , noted for its symmetrical sunken alcoves . It is a mosque located on a square of the same name . It also contains a caravanserai , a tekyeh , a bathhouse , a cold water well , and a confectionery . At night , the building is lit up after twilight hours after sun set with orange lighting in the arched alcoves which makes it a spectacle . 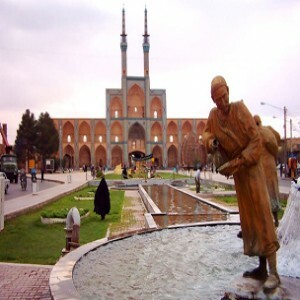 During the Iran-Iraq War and the Iraq wars with the United States and Afghanistan , many Iraqis and Afghanis have come to inhabit the Amir Chakhmaq Square . The mosque is located on a square of the same name , named after Amir Jalaleddin Chakhmaq , a governor of Yazd during the Timurid dynasty (15th-16th century CE) . Separate living areas for Iraqis and Afghanis are nearby . The complex is situated opposite what was the Yazd Water Museum . 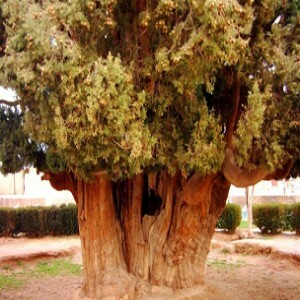 The Cypress of Abarkuh , also called the Zoroastrian Sarv , is a Cupressus sempervirens tree in Abarkuh in Yazd Province of Iran . It is protected by the Cultural Heritage Organization of Iran as a national natural monument and is indeed a major tourist attraction with a height of 25 metres and circumference of 18 metres . It is estimated to be over four millennia old and is likely the second-oldest living thing in Asia , after the 4,845-year-old bristlecone pine (Pinus longaeva) in the Great Basin of California until 2013 . Although not named or officiated , another bristlecone pine also in the Great Basin of California is announced to be 5,062-years-old .